1. Into your chilled mixing bowl, add in your heavy whipping cream. I have a shield that I can attach to my mixture so that it won't splash all over the place, but if your bowl isn't large enough or you don't have a shield, whip up in 2 separate batches. Just before your whipping cream starts to thicken, add in your vanilla extract and powdered sugar. I don't like it too sweet so you can adjust accordingly to your taste. Once done, put in fridge until ready to use. 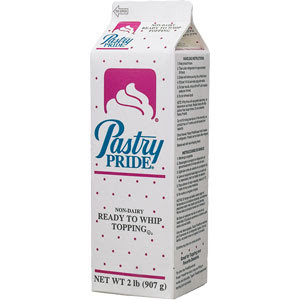 If you're using Pastry Pride, follow the instructions on the box. 2.Pour 1 cup of sugar into food processor and let it run for 30 seconds to create a fine granulated sugar. Set aside. 3. Take your cake flour and salt and sift over a large piece of parchment paper. Then, lift the parchment paper and pour it back into a sieve fitted over a large mixing bowl and sift again. Continue process 3 more times! Set aside. 4. Mix your oil/water/vanilla extract and orange juice together in a small bowl or measuring cup. Set aside. 6. Beat your egg yolks with the caster sugar until it's pale yellow. Thick ribbon like streaks should be falling off of the beater back into your bowl. Set aside. 7. Beat your egg whites until foamy. Add in your cream of tartar. Continue beating until soft peaks. Switch to a balloon wire whisk and whisk by hand until stiff peaks. 8. Take your reserved oil mixture, give it a little stir, and then add it into your EGG YOLKS MIXTURE. Once mixed in, whisk in your flour mixture, a little at a time. Once thats fully incorporated, take a clean wire whisk and CAREFULLY fold in a little bit of your beaten egg whites and continue this with the rest of the egg whites. Work quickly and use as little strokes as possible. It's okay if you see tiny streaks of white. Don't waste too much time on that. 9. Pour into UNGREASED layer cake pans and bake at 350 degrees for 30-35 minutes. Once done, remove and invert cakes upside down to cool down on 2 racks fitted over two colanders. 10. In a small saucepan over medium high heat, boil 1/2 of water with 1/2 of sugar until it reduces to about half. It will start to thicken up slightly and it will change color. Pour mixture into a bowl over an ice bath and stir until thickened like syrup. The longer you leave it on there, the thicker it will get. Once to your liking, remove from ice bath and set in fridge until ready to use. 11. Chop up some fruit and divide them equally amongst 3 bowls and add in your reserved whipping cream into each bowl. Remember to leave a good amount for frosting the tops and sides of your cake!! 12. Once your cakes have cooled, take a serrated knife and cut into each one. Take your fruit filling and begin to assemble your cakes, one layer at a time. Frost the tops and sides and decorate with fresh fruit/berries of your choice. Drizzle tops with the simple syrup. Place in fridge until ready to indulge! Happy Eating!! *I would highly recommend that you try the spongecake on it's own first before you attempt this cake. I actually prefer to eat this cake plain, with absolutely no other toppings, whatsoever! I like more cake then whipped cream, so if you wish, you may up the amt. of heavy whipping cream(just remember to adjust the amt. of powdered sugar/vanilla too). Remember, you have to use an ALUMINUM pan/angel food cake tube pan for this recipe. This spongecake contains no baking powder, so the batter needs something to cling on to while it's baking to help give it more height. If you use a non stick pan, your spongecake will not rise as much while baking. Once baking has complete, run a knife around the sides of pan, and also in the center of the pan to remove your cake. You want a home cooked meal but don't want to spend hours slaying away in the kitchen?? Well, HELLO! No need to look any further! My roasted chicken will fill you up and takes only minutes to prep! Preheat your oven to 425 degrees F. Move your oven rack to the lowest rack possible (for the chicken) and have another rack on the second to highest rack (for the brussel sprouts). 1. Take a roasting pan or baking sheet and line it with foil for easy clean up. Set this aside. 2. Combine your ingredients for your dry rub into a small mixing bowl and then set aside. 3. Place your potatoes and carrots on your baking sheet fitted with the foil. Drizzle on some olive oil and then season with salt, pepper, garlic and onion powder. Toss to coat and if using, place an oven rack right on top of the veggies. 4. Put your brussel sprouts on some foil (or baking sheet) and drizzle some olive oil. Season and toss to coat. 5. Get your chicken and rub some olive oil all over it, coating both sides. Take your dry rub and begin to evenly distribute the rub. Don't overly coat the wings. Remember there isn't a lot of meat on there, and you don't want to make it too salty. A pinch on both sides will suffice. If your chicken is smaller (less than 5 pounds, use 3/4 of the dry rub and put the rest in an air tight container). 6. Using a butter knife, get under the skin and place some butter underneath. Do so, on both sides. 7. Stuff the cavity with your garlic and onion. 8. Using some kitchen twine, tie together the legs. Place your chicken over the carrots and potatoes BREAST SIDE DOWN. 9. Bake chicken for 45 minutes. 10. After 45 minutes, add your brussel sprouts and flip your chicken over and continue to bake for another 40 minutes. 11. Flip your brussel sprouts at least once during roasting. They should take about 20 minutes so make sure to keep an eye on them and remove them when they are ready. 12. After about 1 1/2 hours total, your chicken should be done ( or until a kitchen thermometer reads 165 degrees). I like to turn off the heat and then leave my chicken in there for another 10-15 minutes (depending on how large my chicken is). 13. Remove the chicken from the oven and allow it to rest on a cutting board for 20 minutes before slicing. Serve immediately with your vegetables. NOTES: At home, we like to eat our chicken and roasted vegetables with a side of rice. My kids enjoy it with soy sauce while I enjoy it with my sweet and sour dipping sauce . You can find that recipe here. As mentioned in my tutorial, this recipe was accidental. I didn't want to waste any of my homemade pizza dough that took nearly 2 hours to rise so I thought, "hey, why the heck not??" These are yummy, soft, and SUPER CHEESY!! 1. Move your oven rack to the lowest rack. Preheat your oven to 450 degrees F.
2. Over low heat, melt your butter. As the foam rises, carefully scoop it out. Be careful because the butter may spatter! Strain the butter and set it aside. 3. Take a piece of parchment paper and place it on your baking sheet. Sprinkle some cornmeal on it and set aside. 4. On a lightly floured surface, gather up your dough scraps and form a ball. Roll it out into a small rectangle about 1/4 inch thick and place it onto your baking sheet with parchment paper. 5. Using a pizza slicer, slice your bread sticks about 1 inch apart from each other. Cover loosely with saran wrap and wait for them to almost double in size, about 20-30 minutes. 6. Coat your bread sticks with the clarified butter and then top it off with some onion powder, garlic powder (lots of it), mozzarella, and then finally your parmesan. 7. Bake until the cheese has fully melted and you see some slight brown spots on the outer edges. Serve immediately! Notes: In the tutorial, I tested these out on the baker's stone and I did not like the result. Unless you like your bread sticks crunchy on the bottom, I'd recommend against it. I love them on an aluminum baking sheet though! So soft and moist! Also, I realize that parchment paper isn't meant to withstand temps as high as 450 degrees F. but keep in mind that it isn't in there that long. The edges will begin to brown, but that's it. If you choose to, you may omit the parchment paper and spray some cooking spray on the baking sheet first, sprinkle on some cornmeal, and then place your dough on top of that. Serve it with my homemade marinara sauce! Who doesn't love a homemade pizza?!? If you're saying you don't, well then...we can't possibly be friends! Honestly, I was never a fan on pizza until I started making them at home. I used to make pizza years ago and it was oh, so good! I lost the recipe though so I had to start from the bottom and well, that was kind of frustrating. After a couple of failed attempts, I think I can finally say that I do homemade pizza justice! 1. Place your pizza stone on the lowest rack in your oven. Preheat your oven to 500 degrees F for 30-45 minutes. While your pizza stone is heating, work on your pizza toppings. 2. In a hot skillet, add some olive oil and butter. Add in your sliced onions and season with salt and pepper. Turn heat down to medium low and cook until caramelized, about 30 minutes. Stir frequently to prevent burning. Drain on paper towels. 3. In the same skillet, add a little bit of olive oil and then add in your Italian sausage. If it's in the casing still, be sure to remove the casing before cooking. Season with some garlic and onion powder and cook until browned. Drain on paper towels. 4. Get a round pizza pan and flip it upside down. Place a piece of parchment paper on top of it and then sprinkle on a big pinch of cornmeal. Set aside. 5. On a lightly floured surface, roll out your pizza dough into a 12-14 inch circle. If you are using a homemade dough, make sure you wait 8-10 minutes before rolling it out. Place your dough onto the parchment paper with cornmeal. 6. Using the pizza slicer, trim the outer edges to make a cleaner circle (or leave as is, as long as it can fit on the baker's peel/pizza stone, you're okay). Keep the excess dough to make bread sticks! 7. Top the pizza with some red sauce, leaving a 1/2 inch border around the edges. Sprinkle on your mozzarella. Continue by adding your pepperoni, Italian sausage, uncured turkey bacon, and caramelized onions. You must work quickly here--if too much time passes, your dough may begin to stick to the parchment paper and it may get difficult to remove it, later. 8. Gently slide your pizza (with the parchment paper) onto the baker's stone, close the oven door, and TURN THE TEMPERATURE DOWN TO 475 DEGREES F. After about 2-3 minutes, open the oven door and gently REMOVE THE PARCHMENT PAPER FROM UNDERNEATH THE PIZZA (or else it will burn). Close the oven door, and continue to cook for 7-8 minutes, or until the crust is slightly golden brown and your cheese has melted. NOTES: Different pans will yield different results. Using a pizza stone will give you the best result if you like your pizza crust thin and crunchy. You may use a regular aluminum baking sheet but your crust will be slightly puffier. You may try poking your raw pizza dough crust all over with a fork and then par bake the crust for a few minutes before you add on your cheese and toppings if you want to achieve a thin crust without a pizza stone. I'm sure everyone can name at least half a dozen things to make with homemade marinara sauce! My favorite (and my kids' favorite) is chunky spaghetti sauce! What's your favorite thing to make with marinara sauce?!? With this versatile sauce, the possibilities are endless! 1. Pour some olive oil into a hot skillet. Toss in your onions and add a pinch of salt. Cook until softened, about a couple of minutes. 2. Add in your garlic and a small pinch of chili flakes and cook until fragrant, about 30 seconds. 3. Add in your crushed tomatoes, chicken stock, brown sugar, soy sauce, salt, black pepper, herbs de provence, and dried parsley. If you'd like a smoother texture, feel free to blend the marinara sauce in your blender or use a hand immersion blender right in the skillet. Store any leftover sauce in an airtight container in the fridge. Use in 2 weeks or freeze for longer use. Is there anything more glorious than homemade pizza dough?? Okay, maybe not everyone feels the same way as I do about pizza dough, but one thing's for sure; homemade beats store bought ANY DAY! 1. Add your warm water into a large mixing bowl. Sprinkle in your yeast, olive oil, and honey and wait until mixture looks creamy (about 5 minutes). 2. Add in half of the flour and mix well. 3. Add in the rest of the flour, along with the parmesan cheese, and salt. Mix well with a wooden spoon, and then proceed to mix with your hands. Add more flour (a Tbsp at a time), until dough forms a ball. You may transfer dough onto a lightly floured surface and continue to knead for 5 more minutes. Dough should remain slightly tacky. 4. Place dough into a lightly oiled mixing bowl and toss to coat. Cover with saran wrap, and allow for it to double in size, about 1 1/2 to 2 hours. 5. Punch dough down and wait for 10 minutes (to relax the gluten a bit) before rolling it out. NOTES: Use this pizza dough for homemade pizza. You can find my recipe here. Or for my homemade breadsticks, click here.